Carl Anthony Pavano (born January 8, 1976) is an American former professional baseball player. A right-handed pitcher, Pavano played in Major League Baseball from 1998 to 2012 for the Montreal Expos, Florida Marlins, New York Yankees, Cleveland Indians, and Minnesota Twins. He was a member of the 2003 World Series champions and appeared in the 2004 Major League Baseball All-Star Game. Born in New Britain, Connecticut, Pavano graduated from Southington High School in Southington, Connecticut, the alma mater of former major league pitcher Rob Dibble. Pavano's retired jersey (14) still hangs (unretired as of 2011). At Southington, Pavano led the baseball team to a state championship in 1994. Pavano initially committed to play college baseball at Louisiana State. Pavano was selected by the Boston Red Sox in the 13th round of the 1994 amateur draft. In 1996, with the A level Michigan Battle Cats, he was 6–6 with a 3.44 ERA in 22 starts. This earned him a number of honors including Baseball America first team Minor League All-Star, Double-A All-Star, Eastern League All-Star & Pitcher of the Year and Red Sox minor league player of the year. In 1997, with the AA Trenton Thunder, he was 16–5 with a 2.63 ERA in 26 starts and was selected as a Triple-A All-Star. In November 1997, he was sent to Montreal, along with pitcher Tony Armas, Jr., in a trade that brought Pedro Martínez to Boston. Pavano made his Major League debut on May 23, 1998 by starting and pitching seven strong innings against the Philadelphia Phillies. He allowed one run and struck out six while allowing no walks. He recorded his first win on June 2, 1998 when he pitched 7.1 innings, also against the Phillies. Pavano is well known for giving up Mark McGwire's 70th home run in the 1998 season. He pitched four and one-half seasons for the Expos, making 78 starts and had a record of 24–35 and an ERA of 4.83. Pavano was traded to the Florida Marlins in the middle of the 2002 season (with Graeme Lloyd, Mike Mordecai and Justin Wayne) for Cliff Floyd, Wilton Guerrero and Claudio Vargas. Despite having been plagued by injuries, Pavano became an important part of Florida's starting rotation and had a highly successful postseason in 2003 for the World Series-Champion Marlins. He started Game 4 of the Series against the Yankees, holding New York to one run over eight innings in a game the Marlins would go on to win, 4–3, in extra innings. Pavano followed up his playoff exploits with his best season to date in 2004, posting an 18–8 record and a 3.00 ERA. Pavano became a free agent following the season and, despite receiving bigger offers from Boston, Detroit, and Cincinnati, chose to accept a four-year contract worth $39.95 million with the New York Yankees on December 20, 2004. Pavano during his tenure with the New York Yankees in 2008. Pavano began the 2005 season with quality starts in seven of his first 10 appearances, compiling a 4–2 record and a 3.69 ERA. However, in June of that year, he injured his right shoulder and went on the disabled list. Pavano made 17 starts and finished 4–6 with a 4.77 ERA. The Yankees expected him to be healthy for the 2006 season, but Pavano began the season on the disabled list after bruising his buttocks in a spring training game. He did not pitch at all in the Majors in 2006, making only minor league rehab starts. On August 15, 2006, Pavano broke two ribs in an automobile accident after he hit another vehicle with his Porsche in West Palm Beach, Florida. Also involved in the wreck was Gia Allemand, who Pavano was dating at the time. However, he did not tell the Yankees about the incident until August 28, the day they informed him that they planned for him to come off the disabled list to play that Thursday. In spring training in 2007, Yankees pitcher Mike Mussina said that Pavano needed to prove that he wanted to pitch for the team. Mussina said he did not believe he was the only Yankee who felt this way. "It didn't look good from a player's and teammate's standpoint," Mussina said of Pavano's injuries. "Was everything just coincidence? Over and over again? I don't know." Manager Joe Torre explained that the amount of work Pavano needed to do in repairing his clubhouse image was "sizable." Later that season, after ace Chien-Ming Wang injured his right hamstring late in spring training, the Yankees chose Pavano to start on Opening Day against the Tampa Bay Devil Rays at Yankee Stadium. On April 15, 2007, Pavano was placed on the 15-day DL with what was described as an "elbow strain". On May 23, 2007, it was reported that Pavano would opt for Tommy John surgery in his elbow. In December 2007, the Yankee organization asked Pavano to accept a minor league contract to clear space on their 40-man roster, Pavano's agent, Tom O'Connell, stated that he would consider the request, but he later turned it down. O'Connell also stated that Pavano's rehabilitation was going faster than expected and he might be available to pitch at the Major League level by mid-summer 2008. On July 29, 2008, Pavano made his first rehab start since his Tommy John surgery for the Charleston RiverDogs, allowing one hit and one walk in two scoreless innings. Pavano made his first start of the 2008 season during the Yankees series against the Baltimore Orioles on Saturday August 23, 2008, pitching 5 innings, giving up 3 earned runs on 7 hits, 1 walk and 5 strikeouts in the Yankees 5–3 win. He made his second start of the season against the Toronto Blue Jays on August 29 and was victorious pitching 6 innings in the Yankees 2–1 win. Since his first stint on the disabled list, Pavano did not endear himself to his Yankee teammates, and he stated that he would not visit the team when they played in Tampa Bay, near where he was rehabilitating. Meanwhile, Pavano's agent Tom O'Connell – the fourth agent the right-hander has gone through in his career – believed that Pavano would still be a desired commodity on the free-agent market that winter, even with his injury history. "Carl's a 1–2 starter. Those guys don't grow on trees. Those guys are very rare, 200-inning guys are very rare in this game, and they're the ones that make the money. And he did it two years in a row, before he got hurt, and I'm sure he's going to do it again," O'Connell said. During a game Pavano started on September 14, he allowed three earned runs and five hits before he left the mound in the sixth inning following a visit by the trainer and manager Joe Girardi. Pavano was pitching to Eric Hinske with one out and a runner on first when he got the mound visit. After a short discussion, Pavano walked off the field as the sellout crowd showered him with boos. It was reported as a "left hip injury." During his final season with the Yankees, following the spate of injuries that landed him repeatedly on the disabled list, Pavano came to be referred to derisively by the New York media as "American Idle." During his time with the Yankees, he pitched a combined 26 games, compared to 31 with the Marlins in 2004. On January 6, 2009, Pavano signed a one-year deal with the Cleveland Indians worth $1.5 million with a possible $5.3 million in incentives. On August 7, 2009, Pavano was traded to the Minnesota Twins, for whom he started the crucial third game against the Yankees in the 2009 American League Division Series (ALDS). Following the season, Pavano filed for free agency, but later accepted the Twins' offer of salary arbitration. He ended up having his best season since 2004. During the stretch from May 29 to August 13, Pavano compiled a record of 11–2 with an ERA of 2.79, including twice throwing back-to-back complete games in which one was also a shutout. He went 17-11 with an ERA of 3.75 over the course of the season (in which he also threw 221 innings) and helped the Twins runaway with the Central Division title. However, in the playoffs Pavano lost Game 2 of the 2010 ALDS to the Yankees at Target Field 5–2, and the Twins were swept in three games to end the season. 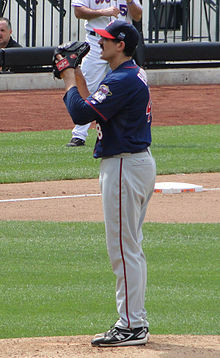 For 2010, Pavano was named the Twins' Pitcher of the Year, receiving the Joseph W. Haynes Award. On January 19, 2011, Pavano agreed to a 2-year contract with the Twins. He was paid $8 million in 2011 and $8.5 million in 2012, along with up to $500,000 in incentives. Pavano was the opening day starter for the Twins on April 1. He gave up 7 earned runs over 4+ innings to the Toronto Blue Jays. On May 1, 2011, after performing poorly against the Kansas City Royals, Pavano took a bat to a trashcan in the Minnesota Twins dugout after being removed in the sixth inning of a 10-3 loss. Pavano responded by saying "That's as frustrated as I can get. It actually felt pretty good. I just kept whaling away with it. The (bat) wouldn't break. I couldn't break a bat in the dugout and I couldn't break any out there (on the mound). It was embarrassing." Pavano's stats as of his May 8 start were 2–4 and an ERA of 6.64, the highest of any Twins pitcher at this point in the season. However, on May 13, 2011, Pavano threw 5 1/3 scoreless innings against the Blue Jays but got the no decision in the Twins 2–0 loss. His pitching continued to improve through late May and early June. Pavano recorded his 100th win in a complete game 2-run performance on June 3 against Kansas City, and he pitched another complete game win 12 days later against the White Sox. Pavano continued the season with mixed success. He finished with a 9–13 record and a 4.30 ERA, closing out the Twins' season with a shutout of Kansas City Royals. Of the five starting pitchers for the Twins in 2011, Pavano was the only one who remained in the rotation for the entire season. Francisco Liriano, Brian Duensing, Nick Blackburn, and Scott Baker all missed starts due to injuries. Pavano was again the opening day starter for the Twins in 2012. He announced his retirement from baseball on February 26, 2014. Pavano was a sinkerballer. He threw his sinker and less-used four-seam fastball in the mid-to-upper 80s. He also had a slider and changeup, the former primarily used against right-handed hitters and the latter primarily against lefties. ^ Vallee, Jason (30 March 2012). "Pavano's Roots Made Him the Pride of the Community". Patch Media. Retrieved 24 January 2018. ^ Hayes, Kevin F. (May 31, 1994). "Yet Another Wait For Young Pitcher". Hartford Courant. Retrieved 24 January 2018. ^ Bryan Hoch (2007-03-09). "Pavano excused from Friday's start: Team announces right-hander left camp for personal reasons". New York Yankees Home Page. Retrieved 2007-09-02. ^ "Pavano tells agent he wants to be a Yankee". CBS. 2004-12-11. Archived from the original on 2005-08-28. Retrieved 2007-09-02. ^ a b Lauinger, John; Brosh, Brendan; Lisberg, Adam (2006-09-17). "Gia Speaks Out. Porsche Pinup Stands By Her Yankee". Daily News. Archived from the original on 2010-03-08. Retrieved 2010-12-23. ^ Mink, Ryan (2006-08-30). "Extent of Pavano's injury unknown". MLB.COM. Retrieved 2007-05-06. ^ Mink, Ryan (2006-08-30). "Pavano's desire questioned by Mussina". MLB.COM. Retrieved 2008-08-03. ^ "Yanks ask Pavano to go on minor league roster". Associated Press via ESPN. 2007-12-11. Retrieved 2007-12-12. ^ Bill Davis (2008-07-30). "Pavano and Hughes on Road to Recovery". New York Times. Retrieved 2008-07-30. ^ "Savior? Pavano Could Pitch For Yanks Saturday". WCBS-TV. 2008-08-18. Archived from the original on 2008-09-24. Retrieved 2008-08-19. ^ Dave Skretta (2008-08-30). "Yankees get money's worth from Pavano". Boston Globe. Retrieved 2008-08-30. ^ "Pavano can't rehab his image". Newark Star Ledger. 2008-04-16. Retrieved 2008-08-03. ^ Mark Hale (2008-09-15). "PAVANO TOO HIP TO FINISH SIXTH". New York Post. Retrieved 2008-09-26. ^ "Indians, Pavano reach one-year deal". Mlb.mlb.com. 2012-06-19. Retrieved 2012-11-24. ^ Paul Hoynes (2009-08-07). "Cleveland Indians trade pitcher Carl Pavano to Minnesota Twins". The Plain Dealer. Retrieved 2009-08-07. ^ Cafardo, Nick (2009-10-11). "Chance for Pavano to fire back at NY". Boston Globe. Retrieved 2009-10-12. ^ Rosenthal, Ken. Pavano accepts arbitration from Twins Archived 2009-12-12 at the Wayback Machine, FOX Sports. Published December 7, 2009. Retrieved December 8, 2009. ^ "Mauer leads Twins' Diamond Award winners | twinsbaseball.com: News". Minnesota.twins.mlb.com. Archived from the original on 2012-10-04. Retrieved 2012-11-24. ^ "Twins agree to terms with Carl Pavano on a two-year, $16.5 million contract | twinsbaseball.com: News". Minnesota.twins.mlb.com. Archived from the original on 2012-10-04. Retrieved 2012-11-24. ^ "Blue Jays whips Twins on Opening Night". Tsn.ca. 2011-02-04. Archived from the original on 2013-12-11. Retrieved 2012-11-24. ^ Gates, Christopher. "Pavano Pounded Again As Twins Drop Second Straight - SB Nation Minnesota". Minnesota.sbnation.com. Retrieved 2012-11-24. ^ "Fantasy Baseball Breaking News". Rotoworld.com. Retrieved 2012-11-24. ^ "Carl Pavano retires after 14 seasons". Associated Press. ESPN.com. February 26, 2014. Retrieved February 26, 2014. ^ "Carl Pavano named new on-air analyst for Miami Marlins TV broadcasts". oxsports.com. April 11, 2014. Retrieved August 13, 2017. ^ Jackson, Barry (February 23, 2017). "Another broadcast legend changes role; Heat ratings down; Marlins media change". miamiherald.com. Retrieved 14 August 2017. ^ "Brooks Baseball · Home of the PitchFX Tool - Player Card: Carl Pavano". Brooks Baseball. Retrieved 21 May 2012. Wikimedia Commons has media related to Carl Pavano.